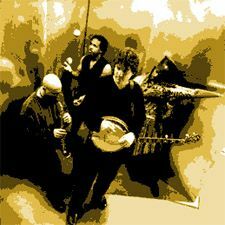 Those fortunate enough to see the world renowned banjoist, Bela Fleck and his Flecktones, (most recently at the Fillmore, and earlier at the Warfield), may be disappointed to learn that the band won't be touring again until 2006. They won't be sitting idle however, as each member will be embarking on a variety of projects including Fleck joining jazz legends, bassist Stanley Clarke and violinist Jean Luc Ponty in a group known simply as "Trio". It's been said, that the one thoroughly American art form of jazz, is comprised of a "blend between the meeting of African and European influences and aesthetics. Spirituals, blues and work songs meld with Bach, Beethoven and Brahms, as well as the rougher forms of European folk music: an authentic sonic Democracy". It's no wonder the result has been endlessly modified and personalized in the music of the Flecktones. Improvisation seems to also present an irresistible welcoming quality, a virtual Ellis Island, amidst its energy and intellect. Fleck took up the banjo at an early age, growing up in Manhattan of all places, eventually migrating to Nashville. Once there, he aligned himself with the now legendary "New Grass Revival", with Mark O'Connor and Edgar Meyer. Desiring to combine bluegrass with jazz, rock, and world music, Fleck began seeking other like minded folks to give life to those ideas. Not long after that, he teamed with virtuoso harmonica player Howard Levy, one of the world's greatest electric bassists Victor Lemonte Wooten, and his eccentric brother, percussionist Roy "Futureman" Wooten. "Futureman", had apparently taken a $10,000 "Synthaxe" guitar synthesizer, cannibalized it, and turned it into an electronic "drumitar", half guitar, half drum machine. The result was spectacular, as they created a sound unlike anything heard before them. After years of touring the globe, and several successful albums, a road weary Levy left the group and was eventually replaced by saxophonist Jeff Coffin. Since then, the Flecktones have performed with an incredible array of musicians; Phish, Dave Matthews, Chick Corea, Branford Marsalis, a Tuvan throat singer named Ondar, Indian tabla master Sandip Burman, reed master Paul McCandless, steel drummer Andy Narell, and many, many others. "We wanted to record the next album with just the four of us, but when you meet all of these amazing people, we felt like we just had to record with them", said Fleck. On their latest recording, the 3-disc set "Little Worlds" the Flecktones once again plumb the depths of their worldly experiences. In the "Ballad of Jed Clampett", the Beverly Hillbillies have an unlikely meeting with Weather Report. From there, as many influences and styles as possible are organically, convincingly congealed around the core quartet's sound and its own unique, even quirky brilliance. But it's all in fun.the tempos, ideas, references and energy shifts are often enough to keep you on the fence between laughter and awe. Even via a peripheral listening, at times you'll hear shades of Frisell, Garbareck, King Crimson, Flatt and Scruggs, the aforementioned Weather Report. Bassist Wooten is virtually now considered the "Paganinni of the electric bass" and the heir apparent to the late Jaco Pastorious. Among many other auspicious projects, both he and Bela add tracks to Mike Stern's release, "These Times." Jazz review said of "Little Worlds", "Funny things do happen when anything is brought to America - democracy, free trade, music and art. We put our own spin on everything, especially when it gets 'lost' and fermented, specifically in places like the mountains where time and culture nearly stands still. In this case specifically, Appalachia. This is where Bluegrass came to be, carefully harking the long remembered, recognizable strains of Elizabethan honor. But possessing in their stead the original spirit and concept of improvisation the composers of European art music relied on to produce new works remains in Bluegrass country and especially the music itself. Though its origins emanate from lofty exclusionary society, its since been released from its Bastille and remains a vivacious music of the people". In Nashville, where country and bluegrass abound, lives a musician "caught on the fence between various musical worlds, overlooking their backyards, taking what works, and fusing the rest to his own taste". The members of Bela Fleck and the Flecktones will be touring individually, with Victor Wooten and his group coming to the Fillmore. Until their return in early 2006, this may be the best way yet, to experience some of the most awe inspiring music around.